Ron Stallworth pictured above after an interview with student journalists, including Q&S’s Nichole Shaw. Charles Peckman/The Daily Iowan. 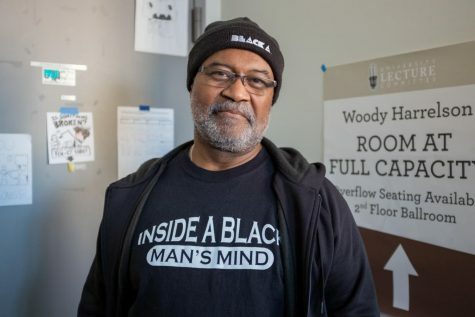 Quill and Scroll spoke to Ron Stallworth, a retired police officer and author on Jan. 23 to tell us his story about infiltrating the Ku Klux Klan in 1979 Colorado. Listen to our podcast here or continue reading below for the written article version. As a police officer, Stallworth’s main priority in this investigation was to uncover valuable information regarding Klan plans and violence that could harm the public, most specifically the black community, Stallworth was employed to protect. While Stallworth was a police officer, his book, the movie and our interview with him showcased a variety of similarities to journalistic principles and practices in the importance of having the public’s interest in mind and investigating for information that would prevent them from harm and expose those who are unfairly exploiting or targeting the public. The University Lecture Committee brought Stallworth to the University of Iowa for community members and students to not only hear his lecture on his book, but a true account of his experiences in being a black police officer in the late 1970s. We explored what it means to do undercover investigative work, and Stallworth said it the most important thing someone can do when going undercover is stay true to who they are. 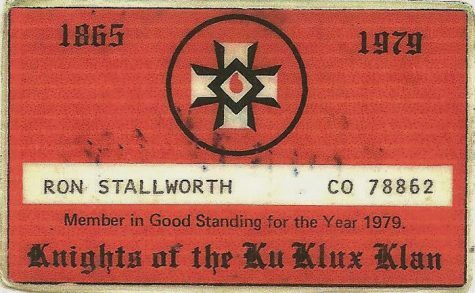 Ron Stallworth’s KKK membership card mailed to him in 1979 during his investigation and infiltration into the Klan. His advice emphasized the importance of maintaining an image as close to your natural persona as possible, without fully fabricating your identity. Those things that are naturally ingrained in your mind will suit you in the ability to conjure up information about your identity quickly without exposing your deception or putting you in harm’s way. When asked about how his experience in infiltrating a group of white supremacists, and speaking with David Duke, Grand Wizard of the KKK, made him feel, he responded by laughing boisterously. “We were pulling a con job on the Grand Wizard,” he said. Throughout his experience in infiltrating the Klan and gaining information on their inner workings and plans, Stallworth remembers how he could not stop laughing, and still cannot stop, because of the absurdity of the situation. The derogatory and racist language used in the investigation when conversing with Klan members were words Stallworth said he grew up used to hearing all his life. Throwing those words around meant nothing to him, he said, because he was acting. For journalists, that means when going undercover, while you must aim to stay true to your natural persona, you must also adopt an actor-like distance from the identity you’ve conjured to gain information from subjects. Your job as a journalist requires you attain valuable information from sources to serve public interest and expose corruption and harm being done to a community, harm that outweighs the harm you’re doing by deceiving your source. In a world where we as journalists are targeted for being connoisseurs of fake news, we must hold steadfast to our core principles of fairness and accuracy. 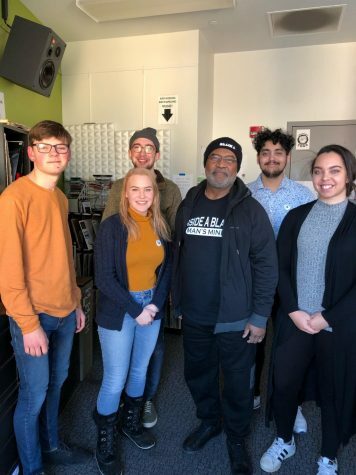 In order from left to right: Harry Westergaard (Iowa City West High), Anna Kirschling (KRUI), Charles Peckman (The Daily Iowan, back left), Ron Stallworth (center), Sameer Ali (KRUI, back right), Nichole Shaw (Q&S). Just like journalists are being targeted as connoisseurs of fake news, Ron said minority groups are targeted today by majority leaders. He emphasized the importance of politics and how they inform every issue in the United States, especially racial issues, not only back in the 70s and 80s, but today as well. Stallworth linked this statement by Trump to a lot of the things that David Duke, the KKK Grand Wizard, said 40 years ago. Duke called himself the national director of an organization—that organization being the white supremacist one we popularly know as the Ku Klux Klan. Duke aimed to present a positive image of himself to the public in not wearing his Klan robe in front of the public and in not using the n-word in public, among other things. “We have a con man in Washington right now,” Stallworth said. He references to Trump as a con man because Stallworth said the way Trump expresses himself is the way undercover cops talk—it’s the way Stallworth himself used to talk, and compares the president’s mannerism and actions to those of Duke who spread the gospel of Klan-ism and white supremacy under the false colors of a relatively genteel and socially acceptable appearance that isn’t violent. 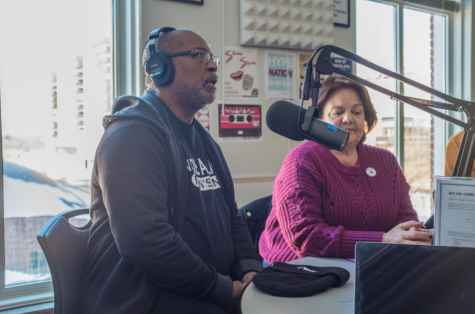 Ron Stallworth, left, pictured next to his Latina wife, right, on Jan. 23, 2019 during our interview. Charles Peckman/The Daily Iowan. So, the racial and political divide that Ron saw in the 1970s, he sees now in the representation of Donald Trump and Steve King (King being an Iowa representative of the House who was removed from committee assignments due to white supremacy remarks he made). However, Stallworth said the Donald Trumps and Steve Kings of the world are going to die in 20 to 30 years, the United States will be minority-majority. That statistic matches a U.S. Census Bureau report, who predicted that by 2045, there U.S. will be minority white. In the meantime, Stallworth urges constituents to vote Trump and King out of office, saying the those David Duke’s of the world must be removed from the public sphere. As a minority, both in his time in the police force and now as a retired black man, Stallworth emphasizes the importance for people to never invalidate you or your experiences. Stallworth was a black cop, but he when he took his badge and uniform off, he was just a black man in America, and he said he was subject to the same treatment any other black person was. Black police officers, he said, are part of the black community too. “We are too black for the white community and too blue for the black community,” he said. This is important for journalists to recognize as people of color, women, or coverage of minority groups in the publishing industry. Stallworth emphasized you have to beat those who are aiming to marginalize you at their own game. As a woman, as a minority or even as a white man in a minority environment, if someone else is trying to pick on you or invalidate you, play their game and beat them at it.